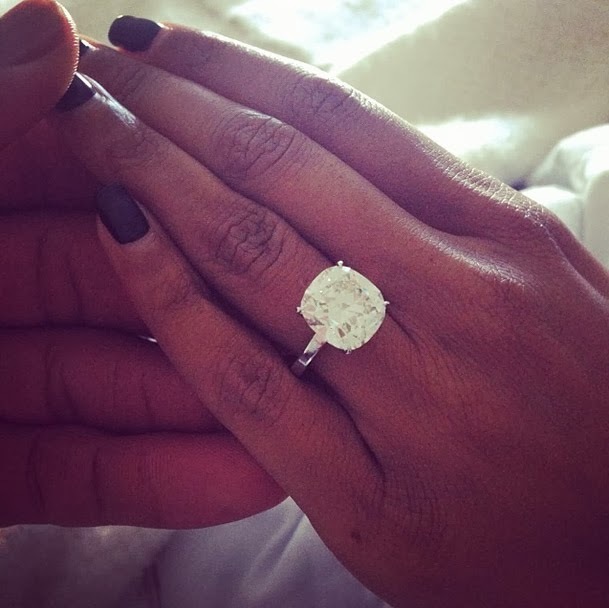 Via Gabrielle Union instagram: Her Engagement Ring is Forgiveness Size! In the world of “black entertainment” Gabrielle Union and Dwyane Wade is big news. As you know NBA superstar fathered a child outside of his relationship with Gabrielle Union. They recently got engaged and say that the child is from a relationship Dwyane had when they were on a break. Many gossip blogs especially TMZ.com question that. It does sound quite messy! However, I can’t help but feel a bit sorry for Gabrielle Union because nobody is showing this woman any mercy. I’ve read many blogs and facebook statuses that call her all types of naïve and stupid. Let me say I’m not a fan of Gabrielle Union’s but I can’t help but feel for her. It seems that people are more focus on Gabrielle and her forgiveness of her fiancé than people criticizing Dwyane Wade and his stupidity. I’m torn because on one hand it’s really none of our business and I wouldn’t want millions of people in my personal life but I understand that they are celebrities. Private life is really something you give up when you are a celebrity. Your business is our business, when you want our money for your “talent”. I just wish that people would focus more on the actions of Dwyane Wade. Forgiveness is not something that should be looked upon as a negative action. Stupidity now that’s a different story!